I was asked to write a little bit about my tripawd rescue, Cali. When my boyfriend and I first saw Cali’s story, it was through Facebook. The Friendship Animal Protection League had found her in Cincinnati (about 3 hours away from our location), she was only 10 weeks old, stranded on the side of the road with her paw cut off, cigarette burns on her body and was malnourished. She had clearly been abused by her previous owners and was left to die. The wonderful people at Friendship APL moved Cali up to Cleveland to have emergency surgery, the amputation of her front right leg was the best shot she had at survival. 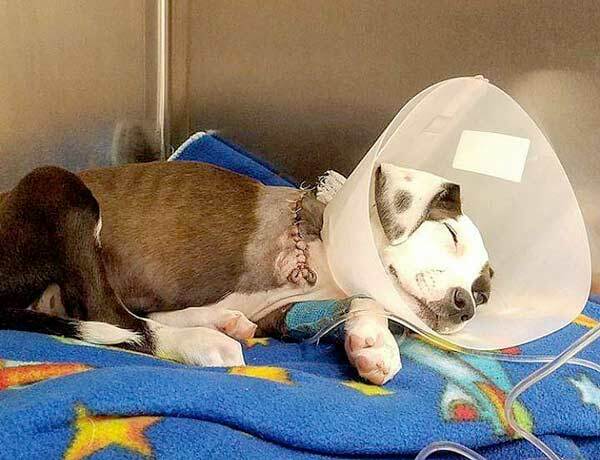 There were complications during the surgery and Cali almost did not survive, but with the help of the medical staff and Cali’s will to live, she fought for her life. 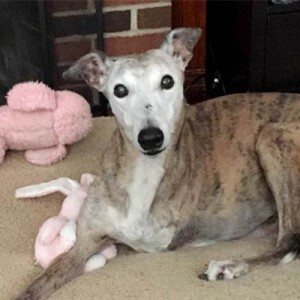 Cali’s story touched our hearts as we continued to follow her story very closely over the next week and even donated to the costs of her surgery. We had been in constant contact with the Friendship APL, where Cali was recovering following her surgery, and it soon became apparent they were having an issue finding a foster family to care for Cali as she was recovering from her surgery. 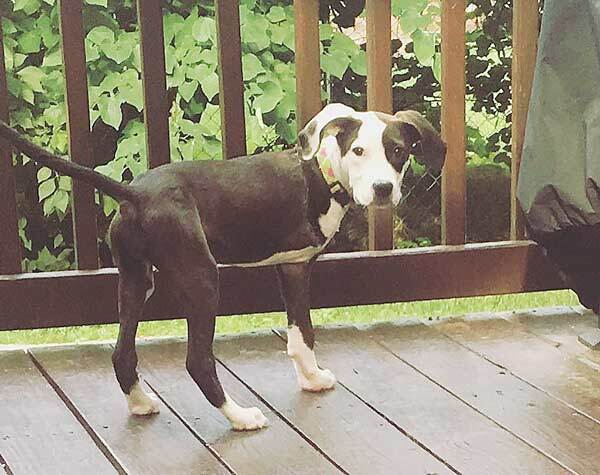 No one wanted the responsibility of caring for a 3-legged puppy. That is when my boyfriend and I stepped in. We currently have a 2 year old, 4-legged dog that we raised as a puppy and we had previously discussed wanting to adopt another dog, so why not adopt Cali. I would be lying if I didn’t say we had major concerns, adopting a tripawd puppy, it was unchartered waters for us. The thought of Cali recovering all alone, broke our hearts, after all she has been through, she needed us. With the many resources we found on the Tripawds website, it soon became a no brainer for us, we immediately called the Friendship APL and told them we would foster to adopt Cali. We picked Cali up 1-week out of surgery and brought her home. Now, we had thought she would be very limited in her movement, with only having 3 legs and all, boy were we wrong. From day one she moved so well and was so fast, we were shocked. Our biggest challenge the first weekend wasn’t helping her walk or move, it was preventing her and our 2-year old dog from playing to hard! She is so resilient and brave. So, if asked if my perception of “special needs” had changed, absolutely, it has changed into a positive thought rather than negative. It has been almost a month since surgery and has been 2 weeks since the stitches have been out. We walk every day. At first she couldn’t walk far. The walks often ended with her being carried the rest of the way home. But, every day she gets a little stronger and walks a little farther. Cali has also learned how to use the stairs, she takes them slow and steady, but has come a long way. She has proven time and time again, with her determination and us by her side, there is no obstacle she cannot conquer. If anyone were to ask me if they should adopt a Tripawd dog, I would say absolutely, yes. It has been one of the most rewarding experiences to watch her grow, learn, and fight back. Cali had a rough start to her life but will now live the most loving, full, and joyous life. Cali, you are such a lucky girl to have found your loving pawrents! Wow, what a start in life you had sweetheart! Tripawds is such an amazing foundation! I can’t say enough good things about them! Good going little girl and keep hopping happily along. What a beautiful girl! Thank you so much for showing her the love and kindness she deserves! What a beautiful face! I applaud you for taking on this challenge. She had such a rough start but it appears she has a bright future with you. Your little life may have started out rough but you hit the “jackpot” in your new forever home!